Turn your radio dial to 107.9 FM in the Philadelphia area, and you might end up picking up a Bernie Sanders ad, sprinkled in with old school Missy Elliott and Tupac songs. Branded as Boom Philly, 107.9 is one of three stations in the area run by Radio One, a national black-owned radio and television company that calls itself “the urban media specialist.” Radio One operates 54 gospel, hip-hop and R&B stations in 16 cities with substantial numbers of African-American voters, including Atlanta, Baltimore and Detroit. Gallup polls and early primary results indicate Sanders’ appeal with minority voters lags that of his Democratic opponent, Hillary Clinton. Many inches of newsprint have been devoted to dissecting this trend and what it could mean for the fate of Sanders’ run for the Oval Office. A vast majority of registered voters in Philadelphia are Democrats and 44 percent of all Philadelphians are African-American, making courting minority voters important for both Democratic hopefuls. Warren Gill, a spokesman for the Sanders campaign, said that it had not purchased any ads specifically in Pennsylvania, which means the spots are likely part of a national ad buy with Radio One targeting black voters. Gill did not confirm where the ads run. The minute-long spots seek to align Bernie Sanders with the legacy of Dr. Martin Luther King Jr. as well as current civil rights causes including mass incarceration. “Bernie Sanders, a reformer who believes in ending racial profiling and mass incarceration so the justice system works for everyone,” intones a deep male voice over earnest string music, before cutting to a clip of Sanders giving a stump speech. The ad does not feature any heavy-hitting celebrity endorsements, a la Sanders’ ad played before the South Carolina primary with director Spike Lee. A half dozen informal conversations with black voters in Philadelphia yield a range of reactions to Sanders’ campaign, and its attempts to woo them. During the lunchtime rush at a Center City falafel stand, Daekwon Smith called himself “probably one of the most the most liberal 18-year-olds on this street” and said Sanders’ stances on social justice and economic reforms won him over. “I like him as a person, and I like him as a politician,” he said. Still, he said Sanders’ campaign could do a better job reaching out to minority voters, citing radio and television appearances as a good way to do that. 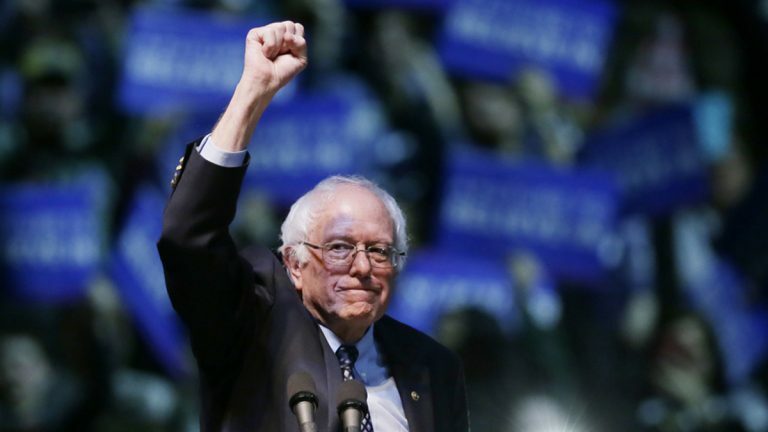 “Bernie Sanders needs to actually put himself directly in front of young minorities,” he said. Waiting in a bus shelter on Walnut Street, Mark Allen said radio ads targeting him wouldn’t sway him from his plan to vote for Clinton. Another traveler, Robert Adams, 59, said simply of Sanders, “I don’t know him.” Whether swayed by views, media or name recognition, Pennsylvania Democrats won’t be able to vote on any candidate until the April 26 primary.